I took this photo during one of my walks through Brompton Cemetery in London. I’ll leave it up to the individual viewer to interpret close since it may have different interpretations for each person. This entry was posted in Weekly Photo Challenge and tagged 50 Year Project, Brompton Cemetery, Cemeteries, Close, England, Life, London, Photo, Photography, Postaday, Weekly Photo Challenge. Bookmark the permalink. I see that. Sometimes when I see this tree it looks like it is hugging them. It always gives me a peaceful feeling. Thanks! 🙂 I think most images can be interpreted a million ways. Thanks for the well wishes…I’ll need it. I’m curious to see how far I will get. That’s the fun part. what an incredible Guardian tree! I bet it could tell some wonderful stories. Thanks Anne. I’m really enjoying all of the different interpretations on the blogs this week. One word means so many different things to people. It is one of my favorite parts of the day, walking through here with my buddy Miles. I always feel safer when I’m near this tree. Nature can heal the soul. Thanks Jo. Well, always trees do not give shelter on graveyards. My late father lies on this cemetery and look what happened when Downburst passed the cemetery. Next time I’m in Paris I will have to visit. Thanks for sharing your post. Nature astounds me. Nice one! i really must visit Brompton cemetery sometime – I have heard so much about it. It is so beautiful and there are lots of birds in there. I love walking there during the afternoons and listening to the wind through the trees and hearing the birds chirp. The tree is keeping them all close. Great photo! Close and safe…it has such a nice feel. It is a beautiful resting spot. They close the cemetery at night, but I’ve wondered what it would be like. Thanks. I thought it might have personal meanings for each viewer and I didn’t want to force my opinion on anyone. It’s nice to hear what others see and feel. 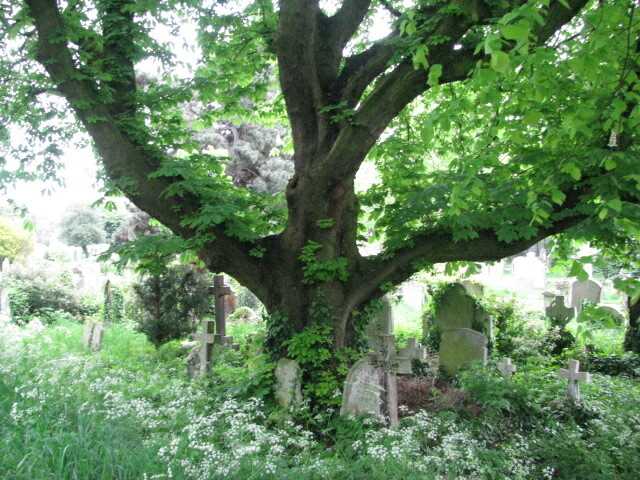 This picture made me think of Ents – wonder what you’d call an Ent that protects cemeteries? You should see all of the trees in the winter…they really do look like Ents. I love creating stories during my walks. And I’ll have to ponder a name for a protective Ent. Thanks Lynn.